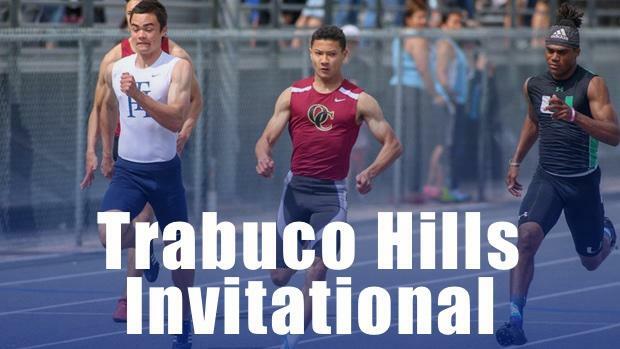 The Trabuco Hills Invitational always showcases a strong cross-section of Southern California's abundance of talent and 2019 figurers to build on that rich tradition with a record number of entries (3,586), athletes (2,355) and schools (95). Here's a closer look at Saturday's second day of this event, which begins at 8 a.m.
Tessa Green of Santa Margarita helped her squad to the SS-Div. 3 team title a year ago, while racking up major points in the 100 and 200 meters. She qualified to the SS Masters Meet in 2018 in the 100 with a wind-legal best of 12.00. The Columbia-bound senior will have to hold off a talented group, led by Upland's Jordyn Grady (12.03 wind-legal best). Chrystal Aluya of Valencia (Placentia) is the current Orange County leader in the 100 meters with a wind-legal effort of 12.09. 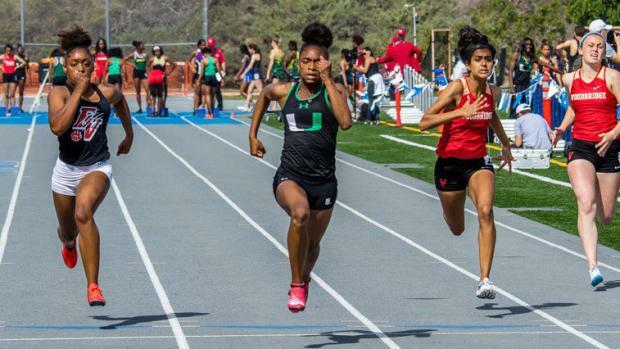 In the 200 meters, Green and Aluya will battle once again while adding Woodbridge's Simran Malhotra and Citrus Valley's Cienna Norman Thomas. Maholtra currently leads the Orange County lists with a wind-legal effort of 25.19. Norman-Thomas was a Masters Meet qualifier in the 400 meters with a 55.00 personal best from 2018 and a heavy favorite in that event. Meanwhile, she has the credentials (24.93w best) to pull off the double this Saturday. In the 400 meters, Norman-Thomas will look to hold off Woodbridge Milana Malec (Scott Padgett photo at right). With a lifetime best of 55.97, Malec has a seasonal best of 57.18. Highly touted in soccer and in her first year joining Track & Field, Santa Margarita's Lauren Memoly has impressed, to say the least. She comes in with a seasonal best of 57.62 for the 400 and 25.92 in the 200 meters. Not much separates the competition in the Girls' 4x100 relay! Redondo is the sixth fastest group in the Southern Section with a seasonal best of 48.04. They will have their hands full as Leuzinger is just behind them in the rankings with a 48.09 clocking. Meanwhile, Santa Margarita (48.31) is ninth in the section with Etiwanda ranked tenth at a 48.34 best. Do not overlook Upland (48.46) who is 12th in the section while Ayala gets into the blocks with a seasonal best of 48.89. Less than one-half of a second separates the top five teams! One of the top freshman to burst onto the 2019 landscape has been Upland's Caelyn Harris. While also one of the top long jumpers in California, she is currently third in the SS-Div. 1 with a wind-legal effort of 15.03. Ranked fourth, and lining up next to her on Saturday is teammate Ajah Anderson. She has a seasonal best of 15.04. Defending South Coast League champ and top-ranked in Orange County, Trabuco Hills' Kiana Stradford will look to keep up with the two Highlanders and break her previous best of 15.19w. Moving to the longer hurdles, one of the best in the San Diego's section occupies lane five. Mission Hills' Maya Occiano With a lifetime best of 43.67, she captured the victory at Laguna Beach two weeks ago with a 46.42. To her outside, Upland's Jordyn Grady is looking to recapture that form. With a best of 43.73, a hamstring injury prevented from the 2018 postseason. Grady (center in Dave Lowe photo at the top of the page) has a seasonal best of 45.85. A CIF-Div. 1 finalist in 2017, Upland's DeMia January has already dipped below 46 seconds in 2019 while trying to improve upon her 45.12 lifetime best. Etiwanda's Kennedi Porter take added this event to her docket this month but has already excelled to a 46.13 best in her second effort. The horizontal jumps feature some of the best in California! Upland freshman Caelyn Harris has already soared out to 20-2.5 at the California Relays two weeks ago. With all of her efforts out beyond the 19-foot barrier, she still seeks a wind-legal jump. All the same, she is one of the best in California and will look to out-match Carson's Indiah Turner (Scott Padgett photo above). With a wind-legal best of 19-5.25, Turner was the California State Meet runner-up in 2018 with a 19-3 effort and the defending Los Angeles City Section champ. 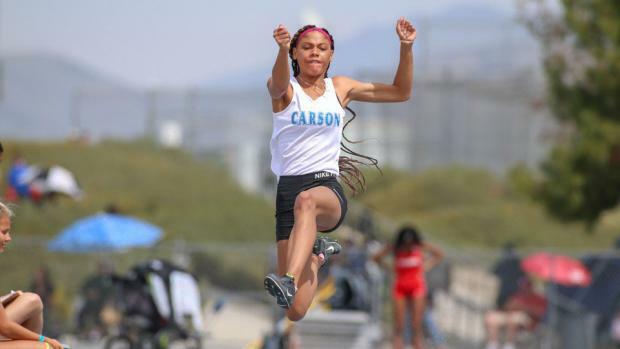 Meanwhile, Capo Valley's Jolie Robinson qualified for the Southern Section Masters Meet in 2018 as she owns a wind-legal best of 18-2. Redondo's Mahkaia Lee measured out to 18-6.5 effort that was not wind-measured but impressed with her third place performance from the Mt. Carmel Invite with an 18-2 effort. The same faces will shine later in the Triple Jump. Except Harris will transition out in place of teammate Kerrington Smith. Smith opened the season up with a 38-4.5 victory on the same runway five weeks ago. Undefeated in 2019, Smith will have to hold off Carson's Arrieya Harper. Harper was a State Meet qualifier with her third-place effort at the LA City Section Championships last year. She bounded out to a 37-6 two weeks ago. Capo Valley's Robinson was a SS-Div. 2 finalist in 2018 while Redondo's Lee and Carson's Turner will look to go out beyond 37 feet as well. Trabuco Hills' Hannah Bevan jumped into another echelon last weekend with her 5-6 runner-up effort at the Woodbridge Invitational. Bevan became only the fifth girl in the Southern Section to achieve that clearance and is currently tied for second in the section (and fifth in California). Her previous best had been 5-3! In the Pole Vault, Redondo's Amari Turner is a heavy favorite. The defending SS-Div. 1 Champion and State Meet runner-up owns a personal best of 12-10. With her seasonal best of 12-6, she is currently tied for sixth in California. The Girls Discus will feature two of the Southern Section's best in Trabuco Hills' Kyliegh Wilkerson and Marina's Alejandra Rosales. The top two in Orange County are currently third and fourth in the section. The defending SS-Div. 1 champion, Wilkerson is looking to get out to her lifetime best of 147-7. That same effort advanced her to the State Meet finals in 2018. Rosales uncorked a 136-5 personal best two weeks ago as she qualified to the Masters Meet a year ago. Angelina Escobar of Bell Gardens and Warren's Faitalia Ahfook are also eyeing 120+ foot efforts this weekend. Rosales is the favorite in the Shot Put, with a best of 37-10.25 this season. Capo Valley's Kamalani Carriera opened her season with a 37-6.5 effort and looking to get out past 38 feet for the first time. Marina's Caitlyn Rayburn and Trabuco Hills' Wilkerson has also thrown the shot out over 36 feet this season. Cristian Moore of Oaks Christian is the main headliner. Emerging with a runner-up finish in the 200 meters as a sophomore at the 2017 State Championships (along with a fifth-place effort in the 100 meters), Moore catapulted into the national spotlight. Injuries derailed him from the 2018 postseason but he is back! His 10.54 and 21.45 wind-legal victories at the Maurice Green Invite two weeks ago cemented his return as he is ranked second and third in California, respectively, in both sprints for wind-legal efforts. Forgoing the hurdles this meet (and defending State Champion in the 300 Hurdles), Upland's Caleb Roberson will look for the upset in both short sprints. Roberson was third at the SS-Div. 1 Finals in 2018 in the 100 meters and gets into the blocks with 10.74 and 21.58 wind-legal lifetime bests. Redondo's Anthony Zuanich and Ontario Christian's Nolan Crespo have several wind-aided efforts under 11.00 and will look to ride the vapor to new bests. The 400 meters will feature Valencia's Kai Wingo. Fourth at the 2018 SS-Div. 1 Finals in the 800 meters, Wingo looks to break 49 seconds and shatter his previous best. He is coming off a 1:53.35 performance last week, which is the third fastest in California in 2019. Santa Margarita's Justin Caragao is coming off a 22.21 personal best in the 200 meters two days ago but will place his focus on the 400 meters (49.97 best). In the meantime, Lennard Marshall of Cathedral has shown tremendous improvement and is coming off a 49.94 lifetime best from last weekend. In the 400 Relay, Upland excelled to a 42.16 victory last weekend, elevating them to fourth in California. Mission Viejo has a seasonal best of 42.63 while Leuzinger comes in with a 42.94 best. Meanwhile, Cathedral is coming off a 43.39 seasonal best from last weekend. Cathedral sophomore Anthony Taylor is looking to steal the attention away from the other headliners. The top freshman in the nation a year ago, he captured the Redondo Invite with a wind-aided 14.50 performance several weeks ago. Ranked sixth in California for the 110 Hurdles, his 38.22 personal best from two weeks ago also moved him up to fifth in the state for the 300 Hurdles. 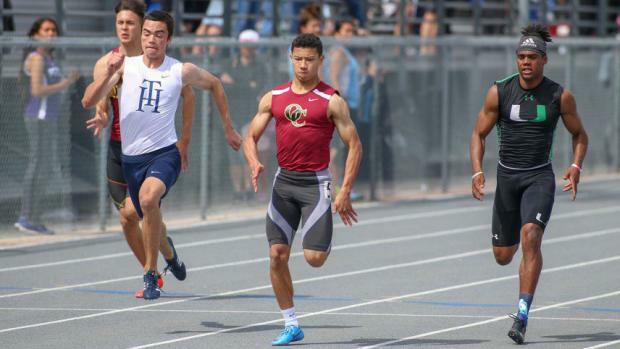 Hart's Cole Shirakata recorded a 14.70 at his dual meet this week while Paramount's Drew Pickett comes in with a 14.93 wind-legal best. While Taylor is the favorite in the 300 Hurdles, Upland's Namir Hemphill has adopted the event and is currently tenth in California with a best of 38.81. Yucaipa's Patrick Cundieff was a SS-Div. 1 finalist in 2018 and has a seasonal best of 39.81 (39.20 personal best) while Bishop Amat's Justin Scalf was a SS-Div. 3 finalist with a lifetime best of 38.88. Meanwhile, Santa Margarita's Michael Ventura has a seasonal best of 39.63. Upland's Jailen Burrell, flew out to a 22-10 effort last month on the same runway and is the top sophomore in California. 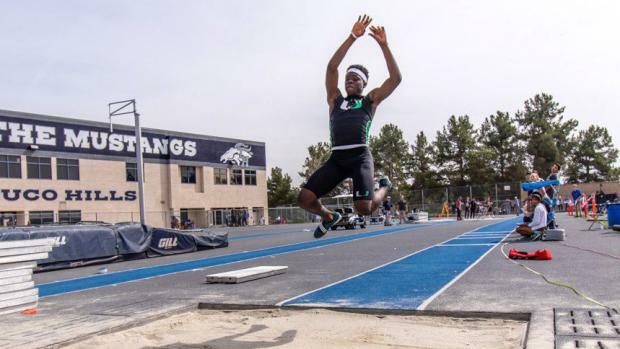 With teammate and state leader, Namir Hemphill (Dave Lowe photo above) opting to keep his focus on the Triple Jump, Burrell's main competition will be Pacifica's David Ko. He is coming off a strong 22-6.5 effort last weekend. 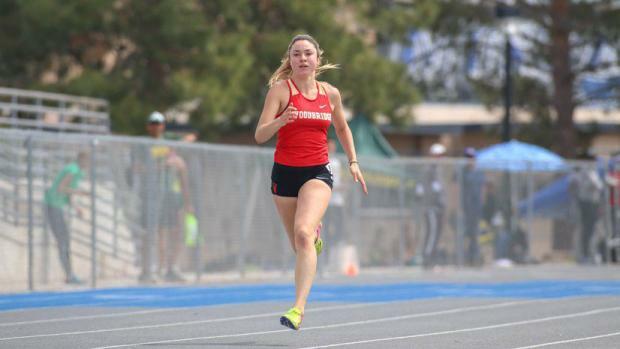 The aforementioned Hemphill was a State Meet qualifier in 2018 and is currently the California leader for efforts under all conditions (48-6.25). Paramount's LaSalle Jackson has measured out beyond 46 feet and is currently sixth in the Southern Section (under all conditions). Meanwhile, Etiwanda's Trevor Harris is one of the best in the section, as his 45-7.5 is sixth in the section for wind-legal efforts. The Boys Pole Vault competition will feature two of the best in the Southern Section. Marina's Skyler Magula is currently tied for fifth in California (15-6 best in 2019) after earning the fifth place medal at the 2018 California State Meet with his 15-10 lifetime best. Looking to join Magula is Quartz Hill's Daniel Palacio soared over 15-1.75 two weeks ago. Palacio was a SS-Div. 1 finalist a year ago and captured the title at the Winter Championships last month. Do not overlook Harrison Rios who has improved as well as anybody in the section, catapulting himself over the 14-6 bar last weekend. His previous best was 13-0! Aliso Niguel's Nikolai Perelman has also cleared the 14-0 bar. Two of the best in Orange County match up in the High Jump. Edison's Aiden Garnett is the seasoned vet and a two-time CIF Finalist while qualifying for the Southern Section Masters Meet in 2018. In trying to get past his 6-6 personal best, Santa Margarita's Max Agbonkpolo just joined the sport a month ago and has already cleared 6-6. He is attending USC in the Fall on a basketball scholarship as the 6 foot-8 inch Agbonkpolo has endless potential, continuing to learn the event on a daily basis. Oxford Academy's David Yi was a SS-Div. 4 finalist in 2018 and has matched his personal best of 6-4 this season. In the throws, Downey's Jose Cisneros is the favorite in both events. Cisneros launched a 49-8.5 effort two weeks while he is currently 11th in the Southern Section with a 163-7 effort. Edison's Jonah Lewis owns a best of 48-0.5 as Cisneros' main competition in the Shot while Grayson Sowers of Ayala has a best of 153-7 in the Discus.